The stores of the future are already here and the one thing they all share in common? Technology. Retailers across the globe are turning to technology as a means to eliminate shopping inconveniences, increase customer loyalty and bridge the gap between the digital and physical shopping experiences. Launched in 2015 by tech giant Alibaba, Hema Xiansheng (or Hema for short) is China’s precursor to Amazon Go. Blending the online with the offline experience, Hema allows shoppers to use their smartphones to shop and pay for their groceries. All the items in the store feature a barcode that can be scanned in the app to unlock information about the product’s origin, cooking instructions, nutritional info, and pricing. Shoppers who live within 3 kilometers of a Hema grocery store can also request that their scanned items be delivered to them in under 30 minutes. The app logs all your purchases, saves your preferences and delivery address, and allows you to pay for your items with Alipay, Alibaba’s mobile payments provider. Because the sales are linked to Alipay, the self-checkout kiosk can also scan your face to confirm your purchase! In addition to being a traditional grocery store and warehouse center, Hema is also known for its innovative seafood market which features rows upon rows of fresh seafood – from live lobsters to abalone. You can even take your seafood haul to the preparation station and have Hema’s in-store cooks prepare your seafood for immediate consumption! Arguably the most futuristic supermarket on the planet, Hema has rapidly expanded to over a dozen cities in China with plans of opening 2,000 new stores in the next five years. What happens when you cross an MIT professor with Italy’s largest grocery store chain? You get Coop Milan, a high-tech grocery store that debuted in December 2016. Billed as the “Supermarket of the Future,” Coop’s tech innovations are the brainchild of MIT professor Carlo Ratti, the visionary architect and engineer at the helm of MIT’s Senseable City Lab, a research group that explores how digital technologies are changing the way people live, particularly in urban environments. Coop lets you scan any of the meticulously displayed items in the store by holding it up to the mirrored display next to it. The Microsoft Kinect sensors built into the displays then reveal the item’s origin story, its carbon footprint, allergens, waste disposal recommendations, pricing and promotions. As customers walk through the grocery store, they can view large real-time data visualization screens displaying content like Coop’s brand values, daily specials, cooking tips, Coop’s latest Facebook posts and info on popular products and in-store sales. While the high-tech grocer is currently only open in Milan, there are plans to expand into other cities soon. Convenience store giant 7-Eleven may not be front of mind for American customers when it comes to cool technology, but they’ve definitely stepped up their game in Asia. The Japanese-owned store recently launched two new 7-Eleven stores in Seoul and Taiwan that are redefining convenience shopping. The 7-Eleven in Seoul is located in the world’s fifth largest building, the Lotte World Tower. Highlights include a biometric verification system that scans vein patterns in the palms of shoppers’ hands, allowing them to pay for their items with a simple wave of their hand. A scanner located at the unmanned checkout system scans the barcode of items and then inspects the size, color and shape of a shopper’s veins, allowing them to pay with a simple swipe of their hand after they’ve registered their Lotte Card user information. The second unmanned 7-Eleven location, referred to as the “X-Store,” just opened earlier this year in Taiwan. Located inside the Taipei headquarters of 7-Eleven Taiwan’s operator, President Chain Store Corp., the X-Store features state-of-the-art facial recognition technology (so customers can “Face In, Face Pay and Face Go”). Other neat in-store technology includes smart voice interactivity, hot spot analysis, microwave ovens with scanners, and robots (to greet shoppers as they come in and to maintain the unmanned store’s spotless floors). Supermarkets and convenience stores aren’t the only industries to go futuristic. Fashion and technology have gone hand in hand since the invention of the sewing machine. 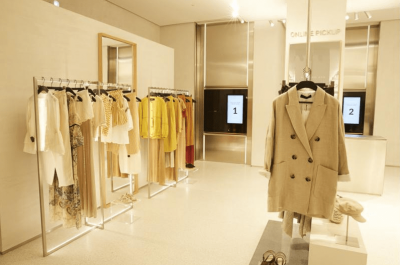 At the new, 48,000 square foot Zara located in the Westfield mall in Stratford (east London), customers can enjoy a host of impressive retail technology from product holograms to robot shopping assistants. Spanish retail giant Zara opened its latest flagship store in London in May 2018. The new location features the usual women’s, men’s, and kid’s sections but also a new area on the first floor dedicated exclusively for purchasing and collecting online orders, with two automated online order collection points that are able to handle up to 2,400 orders at once. To pick up your online order, just scan the QR or pin code in your email order receipt and take it to the pickup point where a robotic arm works behind-the-scenes to retrieve your items and deliver it to you within seconds. Shoppers can also swipe their garments along an interactive mirror equipped with RFID technology to see a hologram-style image of outfit suggestions. iPad-wielding assistants are available to help you choose your size in-store or order online for later pickup. 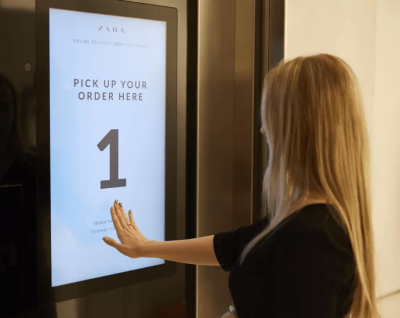 And, following in the steps of grocery stores, the new Zara has a self-checkout option where garments are automatically identified and purchased via credit card or mobile phone. Dubai is no stranger to over-the-top opulence and its new shopping mall – dubbed Dubai Square – is perhaps its most ostentatious yet. The retail metropolis spans 28 million square feet with 8 million square feet of retail space (equivalent to 100 football fields!). Dubai Square is spread across three levels, each with its own unique set of experiences, from waterparks to art exhibits to an events arena with 3D projection mapping. The high-tech shopping mall features smart fitting rooms with interactive mirrors that let you preview different outfits, as well as personalized AI-driven recommendations and 3D printers that ensure the perfect fit. The omnichannel retail space will be elevated by the latest technology, with purchases made online and offline, augmented by custom-designed mobile apps, barcode scanning applications and RFID technology for better inventory management and a cashier-less checkout. Promising to be a playground for tech companies, Dubai Square will be home to the latest innovators in the automotive, computing, sustainable technologies, in addition to 3D printing, drones, AI and other emerging tech.